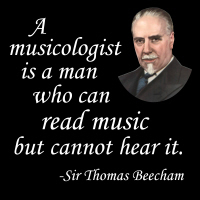 Sir Thomas Beecham, with his inimitable dry wit, nailed the difference between real musicians and those who merely practice the “trade” of musicology! How true this is, as we ponder the incompetent professors, critics, etc. with their fancy sheepskin degrees but little musical intuition or ability to show for it! Buy it now on a t-shirt, hoodie, mug, tote bag or other quality giftware and apparel items. Choose something for your favorite musician, music teacher or student, exclusively from GearGems!